Editor’s Note: The following questions are from OREP insureds and inspectors nationwide. The answers, provided by David Brauner, Senior Broker at OREP, may be helpful when shopping for your E&O insurance. If you have specific questions about your coverage, ask your agent. Question: Do I have Coverage for “After the Fact” Claims? I was advised by another agent to ask about Contingent BI/PD (bodily injury property damage). 1. Specifically, if we are sued after the fact for a leak in the roof which causes extensive collateral damage to walls, floors, furniture etc., would we have coverage for the collateral damage? 2. If we inspect a deck, find no fault with it, and six months later it collapses and injures someone, does our policy provide bodily injury coverage at this point? Brauner: 1. Yes you have coverage. It is included in the General Liability Coverage portion of your policy with OREP. Question: Premises Coverage, BIPD, General Liability: What’s the Difference? Am I covered for premises liability- if, for instance, I leave the water running in the bathtub during an inspection and ruin the floors or run over someone backing out of the driveway? Question: What is Incidental Coverage? I was advised by another agent to ask about incidental coverage. We specifically disclaim any responsibility for wood destroying insects, organic growths, and asbestos. If we were sued after the fact for remediation and/or property damage and/or bodily injury as a result of WDI, OG, or asbestos, allegedly present during the inspection, would we have defense and awards coverage up to our (OREP) declarations page policy limit? Brauner: There are no exclusions for WDI/WDO under your OREP policy and none for additional inspectors, independent contractors, radon, commercial inspections or pool. There are exclusions for mold and asbestos. Remediation of the property is typically covered under the E&O portion of the policy. Bodily injury and/or property damage injury is also covered. Question: Does Big Price Equal Big Coverage? I recently read a story in an industry journal that basically warns me to beware of “low-cost” E&O insurance because, like anything else, you get what you pay for. What about that and why is your program so much less expensive than the one I have? Brauner: The OREP program is less expensive than many programs and competitive with others. Regarding coverage, I agree that there can be coverage differences between policies- we believe that the coverage provided by the OREP policy is as broad or broader than most but this is easy for you to verify on your own with a few clicks. I also agree that it is important to know who you are dealing with: OREP is in year 12. I have been serving the E&O needs of inspectors for 20 years. I’ve observed that E&O premiums rise and fall for two reasons- insurance market conditions and loss history (claims). In “hard” markets, like following 9/11, fewer carriers are willing to write professional liability insurance (E&O) and fewer still will write “high-risk” professions, such as home inspection. You might remember you had far fewer choices back then and you paid much more for your E&O. What else has gone down in price in the last 15 years? In today’s soft market, there are more carriers willing to write inspectors, so prices are more competitive. This is good for you. The second reason why a program’s premiums rise is loss history and/or the total expense of handling claims. If the claims ratio (expenses vs. premium sold) exceeds a carrier’s benchmark, they typically do one of two things: they either raise premiums or stop writing the business. So in short, a higher premium is not necessarily an indicator of broader coverage: with insurance, big premiums do not necessarily mean big coverage. And the opposite is true also: low premiums are not necessarily an indication of narrow coverage. Again, these days it’s not hard to compare coverage and price for yourself with a few clicks. Question: Do I Have Coverage for Infrared Inspections? My franchisor now tells me I need to be covered for infrared inspections. Does my (OREP) policy cover that? Brauner: There is no specific exclusion for infrared inspections. Disclaimer: This article is meant to be used for informational purposes only. It is not the intent of this article to provide legal advice or advice for any specific fact, situation or circumstance. Contact legal counsel or your insurance agent for specific advice. 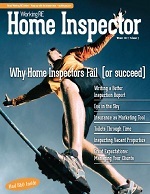 Visit OREP to learn more about home inspector insurance today!